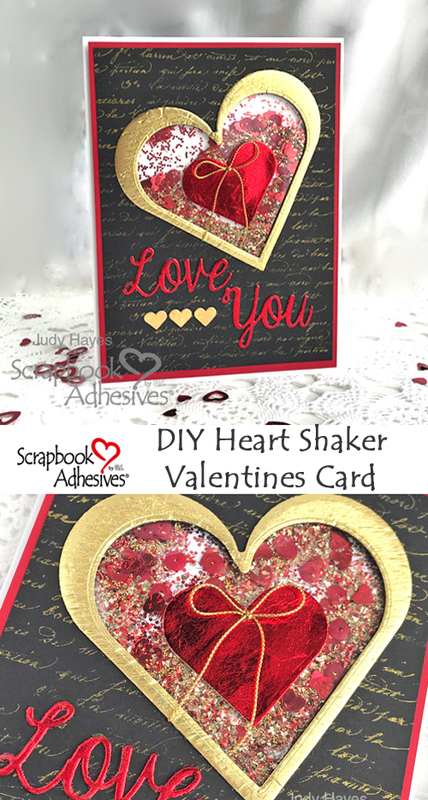 I have a Love You Heart Shaker Card with lots of shiny foil to share today! Love how pretty the red foil is against the black! This card is perfect for Valentine’s Day which is not far away! It could also be used for an anniversary card. 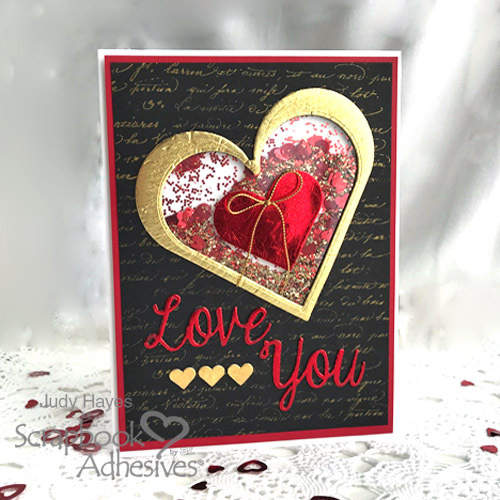 This card features a heart-shaped shaker created with Crafty Foam Tape Black inside to give space for lots of glitter, tiny hearts, and micro gold beads to shake it. 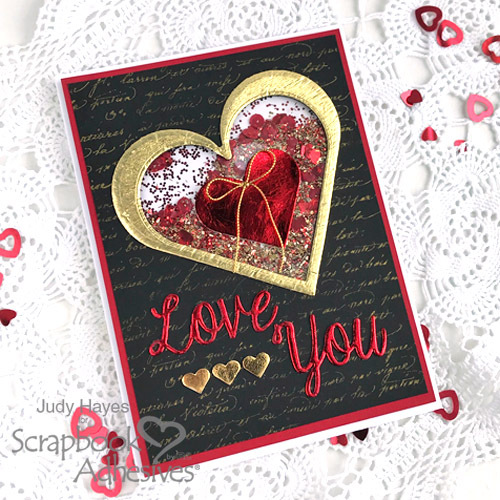 The “Love You” sentiment was cut from 3D Foam Creative Sheet (black sheet) and covered with red foil. Love how pretty and dimensional the words are done that way! If the foam letters tend to stretch because it is a narrow font when removing from the die, cut the words with the die on the printed logo liner side of the 3D Foam Creative Sheets. Mine left a tiny edge of white along the letters in some places so I removed with a point of a craft knife and colored with a red alcohol marker. Apply a gold crinkle paper on one side of a 3D Foam Creative Sheet in black. Nest two heart etched dies together and place on top of the gold crinkle paper. 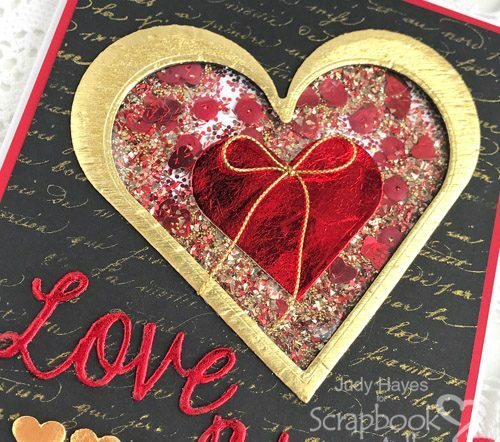 Secure the dies with washi tape and die-cut to create a gold heart-shaped frame. For the card layers, I used black cardstock and a larger piece of red cardstock for a beautiful contrast. 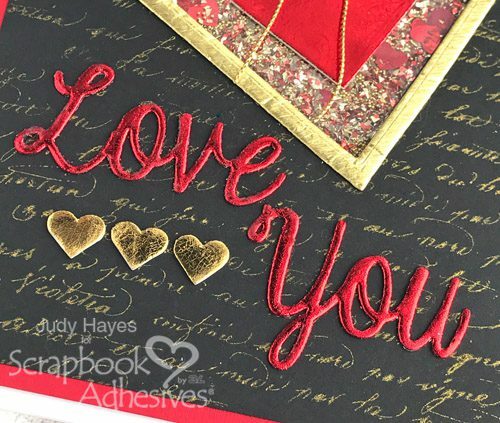 I stamped a gold script on the black cardstock panel and fastened to the red cardstock using the NEW E-Z Runner® Petite Permanent Dots Refillable Dispenser. Love the size of this new dispenser! Using the smaller heart die from the same heart dies of the previous step, I die-cut a heart-shaped window from the layered card panel. Take the gold heart-shaped frame from the previous step remove its back liner and place around the card panel window. Die-cut from clear acetate using the larger heart etched die. Apply Premium Double-Sided Tape 1/8” around the edges of the heart-shaped window on the back of the card panel and place the acetate. Flip the card panel over to place a large 3D Foam Heart on top of the acetate and apply red foil from 3D Foam Creative Embellishment Kit. Die-cut the sentiment from a black 3D Foam Creative Sheet and apply red foil. So pretty! Then place three small 3D Foam Hearts in a row and covered them with gold foil. To me, the foil reveal is like magic! For the shaker feature, I cut Crafty Foam Tape Black in half lengthwise to make it narrower. Start with the point of the heart-shaped window on the back of the card panel and apply the two pieces on each side along the edges. Snip the edges of the foam tape so it would bend/shape around the curve parts. A couple of pieces of the Crafty Foam Tape Black were placed behind the large red foil heart to keep its shape. Now for the fun part: add all the glittery gold and red pieces into the heart shape! To close, I die-cut a large white cardstock heart and applied Crafty Foam Tape Black to fasten over the back of shaker heart. Fasten the shaker card panel to a white card front with 3D Craft Foam Tape Black around all the edges and in the center, I added a bit of E-Z Runner® Petite Permanent Dots Refillable Dispenser. The final touch was to add a tiny gold cord bow with an Adhesive Dots Micro on top of the large red foil heart. This entry was posted in 3D Foam Creative Sheets, 3D Foam Shapes, Adhesives, Advanced, Cards, Crafts & Tutorials, Crafty Foam Tape, E-Z Runner® Dispensers, HomeHobby by 3L, Metallic Transfer Foil, Permanent Adhesive, Seasonal Craft Ideas, Skill Level, Wear your Adhesive on the Outside, Winter and tagged 3D Foam Creative Embellishment Kit with Foil, 3D Foam Creative Sheets Black Small, 3D Foam Hearts, Card, E-Z Runner Petite Refillable Permanent Dots, Foil, IMAGINE Crafts/Tsukineko, Judy Hayes, Penny Black, Premium Double-Sided Tape 1/8", Shaker Card, Spellbinders Paper Arts, Valentine's Day, Wear Your Adhesive on the Outside. Bookmark the permalink.